"The iECG allows us to screen patients for atrial fibrillation in minutes, and treat people early." A special iPhone case and app can be used to quickly and cheaply detect heart rhythm problems and prevent strokes, according to University of Sydney research presented at the Australia and New Zealand Cardiac Society conference recently on the Gold Coast. 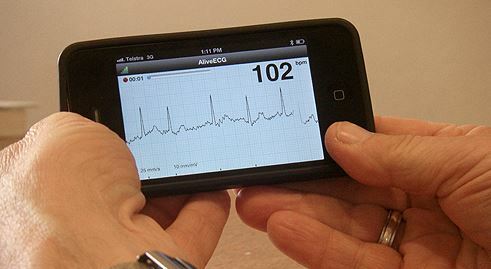 The research found the AliveCor Heart Monitor for iPhone (iECG) was a highly-effective, accurate and cost-effective way to screen patients to identify previously undiagnosed atrial fibrillation (AF) and hence help prevent strokes. 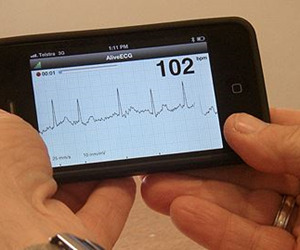 What's more, the test is able to be used in local pharmacies and general practitioner surgeries with a single-lead ECG taken on an iPhone with a special case. Professor Ben Freedman, senior author, said the device was an exciting breakthrough and would greatly assist in the challenge to improve early identification of atrial fibrillation and prevention of stroke. "Atrial Fibrillation (AF) is the most common heart rhythm problem and is responsible for almost one third of all strokes," he said. "AF increases with age, affecting more than 15 per cent of people aged 85 years and over. And people with atrial fibrillation face up to a five-fold increased risk of stroke, and tend to have more severe and life-threatening strokes. "In addition, our research showed that about 1.4 per cent of people aged over 65 (50,000 Australians) have atrial fibrillation, but do not know it. There are currently a large number of people with unknown AF who are at high risk of stroke, but who are not on any medication. "The good news is that stroke is highly preventable with anticoagulant medication, such as warfarin, or the new oral anticoagulants, which can reduce the risk by 66 per cent. "The iECG allows us to screen patients for atrial fibrillation in minutes, and treat people early. This is a huge boost in the fight to reduce the amount of strokes, particularly in people over the age of 65." For patients in the study with a history of known atrial fibrillation, the researchers also identified both a treatment gap and a knowledge gap. The treatment gap they identified was that only 66 per cent of those eligible for stroke prevention medication were being prescribed this medication. Nicole Lowres, lead author also said the knowledge gap of patients with AF was surprising and alarming. "Over half of those with known atrial fibrillation in AF at the time of screening were unaware of their diagnosis even though many of them were prescribed and taking warfarin to treat their condition," she said. "The iECG can be viewed on the phone screen and also used as an educational tool to teach people about their heart rhythm." Lowres also noted how cost effective screening with the iECG could be. "Our economic analysis has shown the iECG is highly cost effective and in fact this is the first mass screening program fir AF likely to be cost effective, unlike traditional 12 lead ECGs recorded by a practice nurse," she said. 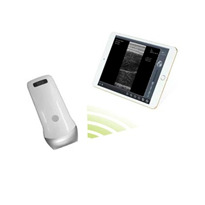 "In addition, the iECG is extremely portable, which gives great flexibility for screening, and is simple to administer. "In a new development, we are now getting receptionists in general practice to record an iECG before patients see their doctor." 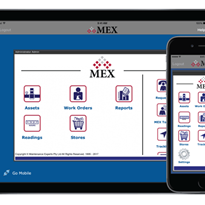 About the iECG: when taking a reading, the iECG can be seen on the iPhone screen in real time. In addition, the iECG is transmitted to a secure server (cloud) where a specialist can review the iECGs remotely. The website can automatically analyse the reading to make a diagnosis of AF. The researchers tested the website's automatic prediction in the SEARCH-AF study and found it correctly diagnoses atrial fibrillation 97 per cent of the time. The researchers are currently trialling iECG screening in GP surgeries in Sydney. The University of Sydney research was funded by a number of investigator-initiated research grants from BMS/Pfizer, Boehringer Ingelheim, and Bayer. The National Heart Foundation provided a scholarship for lead researcher, Nicole Lowres. "The development of the iPhone ECG device just shows how important research and fundraising is in the fight against heart disease and stroke," Dr Robert Grenfell, the Heart Foundation's National Director of Cardiovascular Health, said. "Last year, the Heart Foundation directed $13.5 million in funding to support 195 researchers. This year through the Heart Foundation Big Heart Appeal, we hope to raise $5 million to continue funding this kind of world-class research."